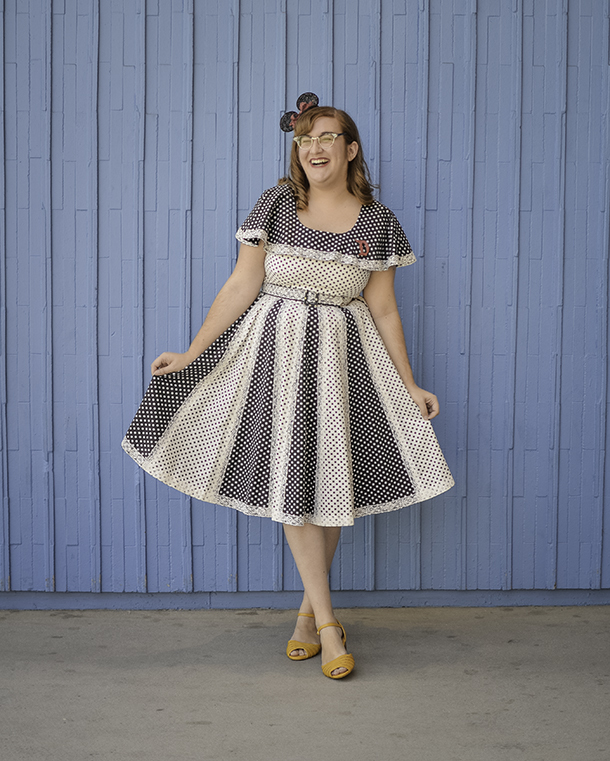 Looking through my recent posts, it kind of feels like I only blog about Dapper Day now. Well, Dapper Day and weddings. I'm still only blogging when inspiration hits, which isn't too often these days. So when a big event happens that makes me want to share, it's one of the few times I actually decide to dust off the old blog. 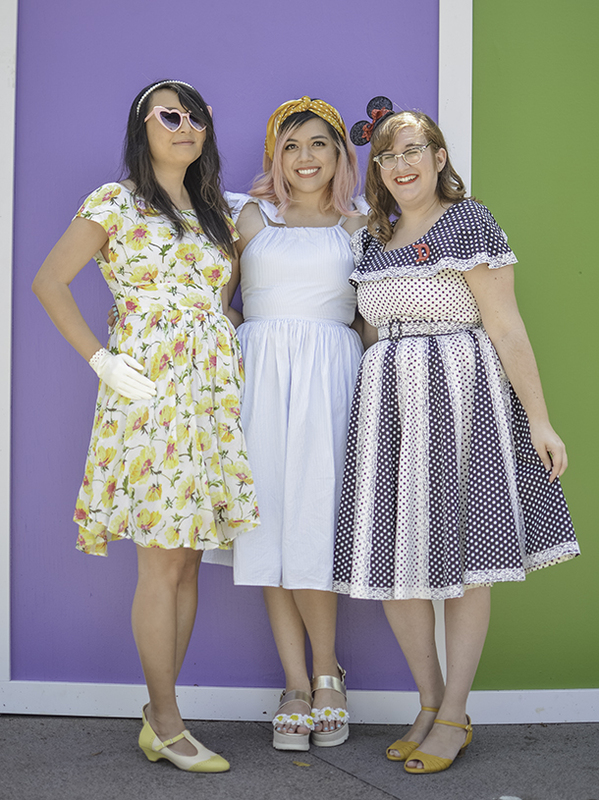 I also don't think I'll ever be tired of talking about Dapper Day. It's such a special event, and I always feel a natural high coming out of it. It's amazing to be surrounded by so many old friends I don't get to see often, Internet friends I've never gotten to meet in person, brands I love all in one place, and overall just a ton of like-minded people with similar interests all dressed to the nines. For this year's spring Dapper Day, my pass was blocked out both days so I couldn't actually go into the parks. Instead, I just went to the Expo one day with my friends Erica and Hanh and then spent some time in Downtown Disney. 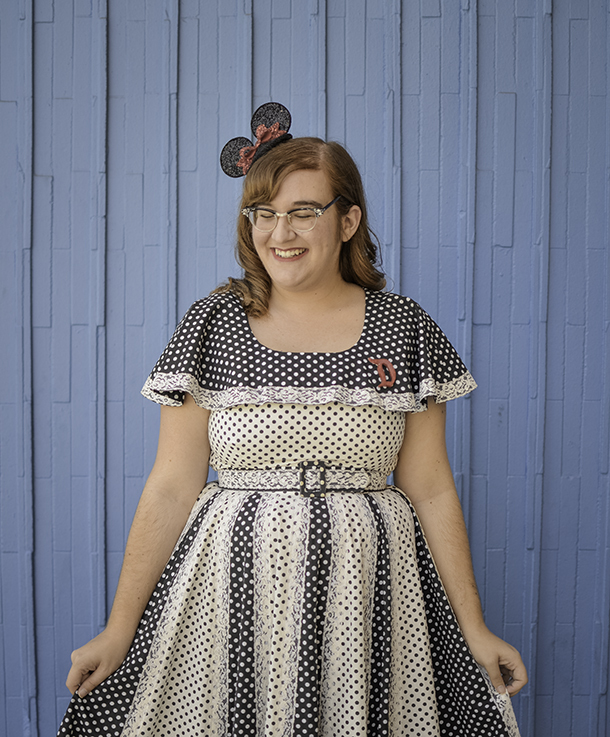 I have to admit, this is one of my absolute favorite outfits I've ever worn and definitely my favorite Dapper Day look so far. The day can be intimidating since a lot of people plan for months, but I tried not to stress too much about it or put any pressure on myself. 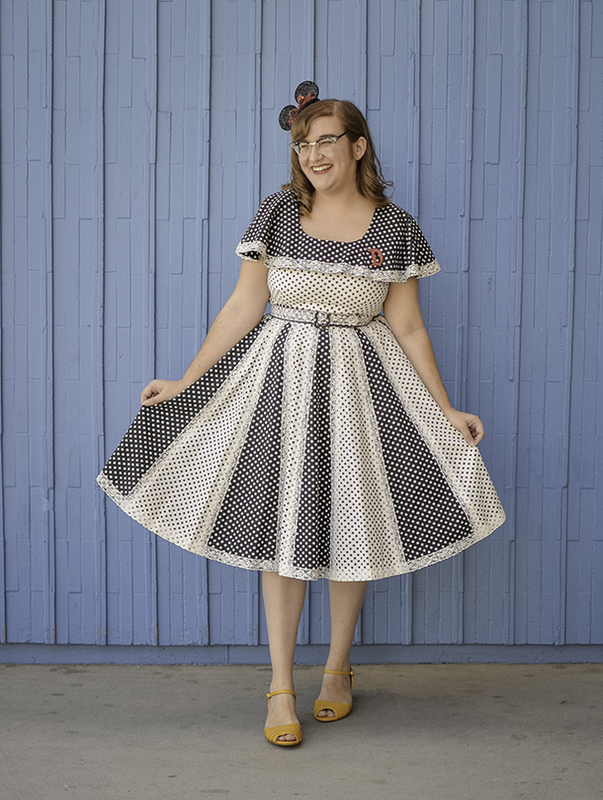 My outfit had been on my mind for the past couple of months or so as I casually perused Etsy whenever I had a chance, but I figured that if I didn't find anything truly amazing, I'd just wear one of the many dresses I already own. Somehow, I got extremely lucky and stumbled upon this dress at an antique mall. I wasn't even there to shop. Jon and I were dropping off our friend Greg, who was in town visiting, and we were wandering around some stores to kill time while he waited for his friend. I decided to take a quick look through a vintage section in one of the big antique malls where I hardly ever find anything, and I couldn't believe that this dress was my exact size and not terribly expensive (it was $45, which is actually really great for true vintage in near perfect condition). I bought it without trying it on and was ecstatic when I found that it fit perfectly. I got the dress about a month ago, but I had been struggling with how to accessorize ever since. I finally decided that I needed some sort of hat or head scarf to distract from the fact that I have no idea how to do my hair. I looked on Etsy last week to see if there was anything that would ship in time, and once I came across this fascinator, it felt like exactly what I was looking for. I had also just gotten these yellow shoes from Modcloth so paired with the polka dots, it made sense to do a little bit of a Minnie bound. The day itself was so much fun, and as always, I left feeling incredibly lucky to have met so many kind people through the community. Every single person I met or talked to was so nice, positive, and looked incredible. I know that some people have had bad experiences with people in the Disney community being catty or clique-ish, but I've yet to actually see that. My favorite part about Dapper Day is that there's no right or wrong way to do it. For every girl with perfect pin curls and a true 1950s dress, there's someone who found a gorgeous replica on Amazon for cheap or someone who took a dress they already own and paired it with pearls. We met a couple of older people who asked us to help them take pictures, each of whom said it was their first time. I wrote about this on Instagram a little bit, but over the past year, I've been coming terms with my minor social anxiety. I'm usually not comfortable in large groups or and I get extremely nervous about meeting new people. It's definitely minor compared to what a lot of other people deal with, but I often struggle being social. 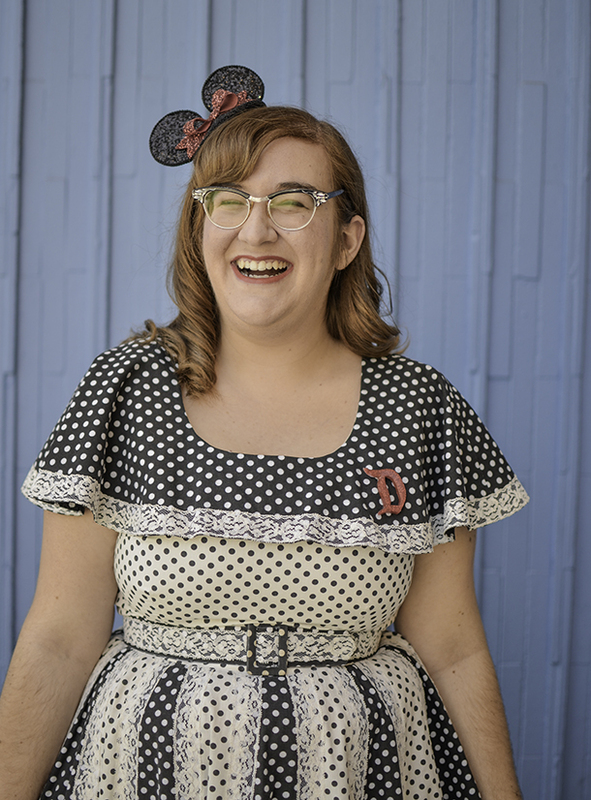 Dapper Day is one of the few times that I actually very comfortable around new people and feel really in my element. I can go in there knowing that I'll know at least a handful of people and that people I don't know are at least some ways a little bit like me in terms of interests. I guess that's why I make such a big deal out of it. It kind of is a big deal. 1) I LOVE hearing about Dapper Day as I live far away and likely will never be able to attend. But the friendliness and joy of all who are there seems very palpable in the photos so glad you have found that true. 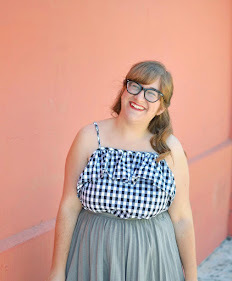 2) This dress might be my favorite of any you've ever worn...which is saying something because I love all your outfits! 3) Thank you for talking about something as personal as social anxiety. I'm glad Dapper day is a day you don't feel that much of that.